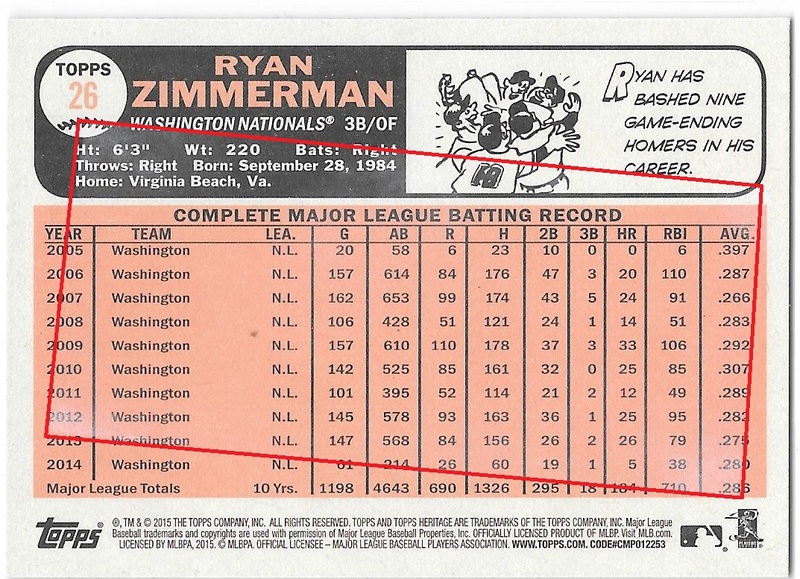 Zimmerman Gum Damage parallel card front. 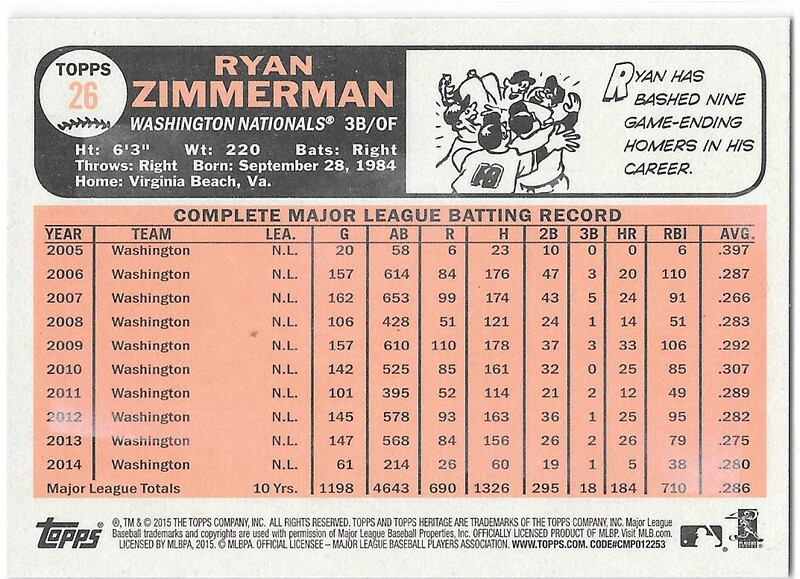 Zimmerman Gum Damage parallel card back. Notice the discoloration in the name box and through the 2012 and 2013 stat lines. It is difficult to see from the above scan, but in this image, I tried to capture the outline of the damage. Here you can roughly see the rectangular shape associated with bubble gum. As expected, this year’s Topps Heritage has a plethora of variations and parallels. However one parallel in particular is turning some heads. Not originally listed as part of the production, collectors have discovered that in 2015 Topps Heritage there is a “Gum Damage Back” parallel. There is no definitive number, but it appears that these cards are falling at an average of 7.5 per 12 box case. That breaks down to approximately one in every two boxes or on in every 48 packs. These cards look like the regular Heritage cards, but when you flip the card to the backside, you can see faint discoloration in the shape of the classic Topps pink gum stick. This variation is an attempt to replicate the vintage look of gum stains that used to occur on cards when bubble gum was a staple in every wax pack. Adding to the façade, if you scratch the back of the card, there is a faint smell of bubble gum. In theory these Gum Damage cards are parallels, so you can find one for all 500 cards in the set (short prints included). But, as more copies surface, it is evident that not all “gum damage” is the same. Even within the same card, there are slight differences in the stain. Because of this inconsistency, the hobby theory is that the damage is not a printing method but rather a chemical substance that is applied to the card. If this is true, then these parallels are damaged on purpose. The gum damaged parallel’s popularity is mixed. Collectors that like these cards, applaud Topps for thinking outside of the box and creating a unique subset. Their counterparts however, make the argument that Topps has watered down Heritage with a glut of parallels and variations to the point of gimmickry. Regardless, both groups are curious as to the value of these gum stained examples, mainly on the issue of intentionally being damaged. Should these cards be valued more than the unstained cards because they are more rare, or should they be considered damaged and worth less (just as the vintage stained cards are)? My personal opinion, for what it’s worth, is that I like them. It adds to the fun of breaking wax. I never bust wax with the idea that I’m going to make money. I look at the process as entertainment, and anything that keeps me looking through the cards enhances my enjoyment. As to the argument that these parallels dilute the product, my answers is “no." It’s a bogus argument. Parallels and variations are not part of the base set, they are extras that have little impact on the overall product. Heritage is still the same product it has always been… set collectors can still make their sets, wax breakers can still break wax, and player collectors can now chase a new parallel. Take the SportSecurities Poll: Do you like the Tops Heritage Gum Damage Parallel?